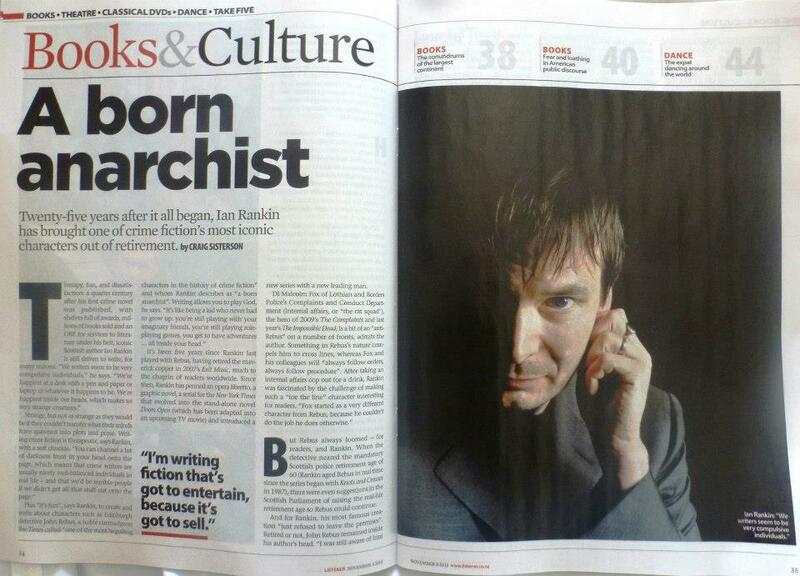 This week's issue of the New Zealand Listener (dated 3-9 November 2012) includes a large feature article based on my recent interview with iconic British crime writer Ian Rankin (see above). I had the pleasure of interviewing Rankin several weeks ago, purportedly about the release of his 'Rebus returns' book STANDING IN ANOTHER MAN'S GRAVE - but like the best interviews, we ended up talking about many more things than just the latest Rebus adventure. It was also one of the very first interviews Rankin had done about the new book - ahead of all the British press etc, which was nice because it meant Rankin wasn't jaded about answering similar questions about Rebus's return, why he brought him back, and wasn't given 'rote answers' he'd used in other interviews etc - the entire conversation was fresh and interesting and I came away from it inspired and 'buzzing'. You are so lucky! I missed him when he came to Montreal last year for a reading, and a few years before that when he was here in Ottawa for our Writer's Festival. A whole tour in your country! I am picking up Standing in Another's Man's Grave for my Christmas present to myself. It's exciting to have Rebus back! and with Malcolm Fox, should be interesting. It sounds like you had a good interview with him, too. Is the link posted yet? I can't see it.